Sunday morning rides in rural low traffic areas to suit cyclists of all abilities – beginners to experienced. We believe in looking out for each other. You won’t be left behind to find your own way home. 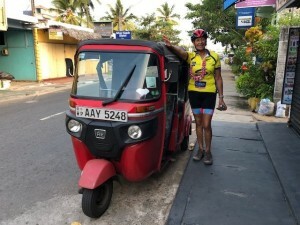 Mere, and our cycling shirt in Sri Lanka. Most weeks there is a choice of three ride distances – 20, 40 or 60 km. Within each distance group there are also different pace groups. You fit in where you feel comfortable, depending on your fitness level and goals. The ride courses vary from week to week and generally are along cyclist friendly routes that avoid main roads. Suitable for ALL types of bicycles. Visitors very welcome. Rides start from various locations, so if you are not on our email list please phone to check start location. Start times: Unless stated otherwise our rides start out at 9.01 am, from the Paengaroa Community Hall in Paengaroa village. 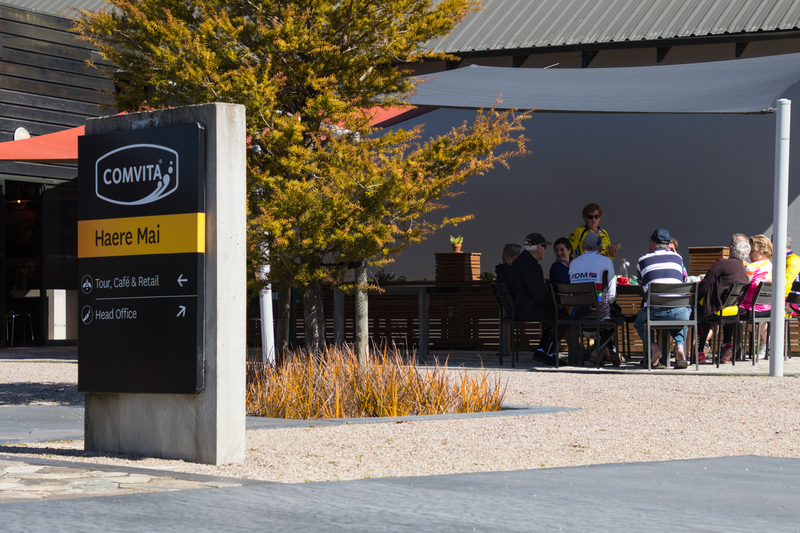 We have an after ride coffee at Comvita. Note: Start time 9.01am is effective from when Daylight saving ends and until Daylight saving begins in September. 21 Apr Ride 1 – 46 km – From Paengaroa Hall. Follow Old Coach Road all the way out to Otamarakau and return. 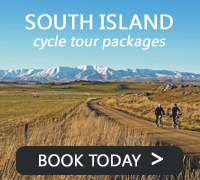 Ride 2 – 30 km Flat rides to Maketu and surrounds. 28 Apr Ride 1 – 52 km – From Paengaroa Hall. Follow Old Coach Road out to where it meets Rotoehu Road, continue up Rotoehu Road until the seal runs out and then return the same way. Ride 2 – 30 km – From Paengaroa Hall. Follow Old Coach Road out and turn right in Roydon Downs go along until you have done 15km in total and then return back to Hall. 5 May Ride 1 – 45 km – Take the cycle path to Maketu Road. Go down Young Road and turn right into Pah Road, Go to the end of Pah Road turn around and get back on the Cycle Path. Go to the very end of the Cycle Path, turn around and exit the Cycle Path at Kaituna Road.Go out to Maketu, either via Kaituna Road, or Te Tumu and Kelly Roads.Return to Hall, via Wilson Road. Ride 2 – 20-35 km - Take the cycle path to Maketu Road. Go down Young Road and turn right into Pah Road, Go to the end of Pah Road turn around and go to Maketu via Maketu Road, or Te Tumu and Kelly Roads. Return to Hall via Wilson Road. 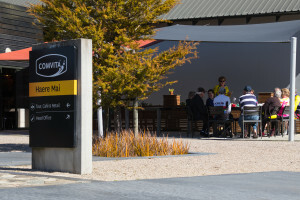 12 May Ride 1 – 45km – Take the cycle path to Maketu Road. Go down Young Road and turn right into Pah Road, Go to the end of Pah Road turn around and get back on the Cycle Path. Go to the very end of the Cycle Path, turn around and exit the Cycle Path at Kaituna Road.Go out to Maketu, either via Kaituna Road, or Te Tumu and Kelly Roads.Return to Hall, via Wilson Road. Ride 2 – 35km – Take the cycle path to Maketu Road. Go down Young Road and turn right into Pah Road, Go to the end of Pah Road turn around and go to Maketu via Maketu Road, or Te Tumu and Kelly Roads. Return to Hall via Wilson Road. 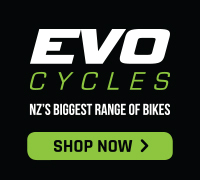 19 May Ride 1 – 46km - From Paengaroa Hall. Follow Old Coach Road out and turn left into Maniatutu Road North, go out to the main highway and turnaround. Turn left back onto Old Coach Road and then right onto Maniatutu Road South, go as far as the seal turn around, on the way back turn left into Roydon Downs Road then return back to Hall. Ride 2 – 30km – Take the cycle path down to Bell Road, and down to the Boat ramp. Back on the cycle path to the Kaituna Road exit. Along Kaituna Road, right into Te Tumu, Left into Kelly, Right onto Maketu and rejoin the cycle path and back to Hall. return. 9.01am Ride 1 – 47 km – From Paengaroa Hall. Out via Cycle path and Young Road to Rangiuru Road. Cycle up Rangiuru Road, left into Casuarina turnaround and come back down Rangiuru Road, and left into Gridley Road, then return to hall. Ride 2 – 37 km – From Paengaroa Hall. Out via Cycle path and Young Road to Rangiuru Road. Cycle up Rangiuru Road do part of Casuarina Dr and to end of Gridley Road. Return to Hall. How to get to Paengaroa, Directions from Tauranga: Take the Eastern Link toll road, at the Roundabout exit at the second exit (Rotorua). Drive 2 km and turn left into Paengaroa village. Take the first right and the hall is at the start of Old Coach Road. Allow 30mins drive time. 35km: Take the cycle path down to Bell Road, go along Bell Road to where it meets Parton Road, return. 41 km – Out to Maketu via Wilson Roads. Up Arawa Road, down into Maketu, along Maketu Road, right into Kaituna Road and follow this road to where the cycle path beside the Tauranga Eastern Link express way begins. Follow the cycle path back to Te Tumu Road, left into Te Tumu, then right into Kelly, back to Maketu and return to Paengaroa. 45.5 km – From Paengaroa Hall. Follow Old Coach Road out to the state highway at Otamarakau. Return to Paengaroa the same way. 52km – From Paengaroa Hall. Follow Old Coach Road out to where it meets Rotoehu Road, continue up Rotoehu Road until the seal runs out and then return the same way. 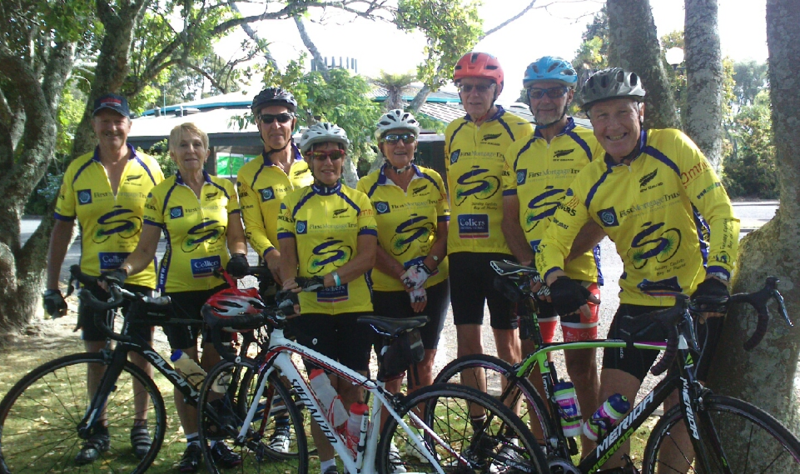 The group was started in April 2007 and is based on other successful cycle clubs like Manukau City Veterans Cycle Club and Matamata Peddlers. In December 2015, we created our cycle shirt. The image above shows some of the group modelling the shirt on it’s first outing. Visit here to see where in the World our shirt has been spotted.